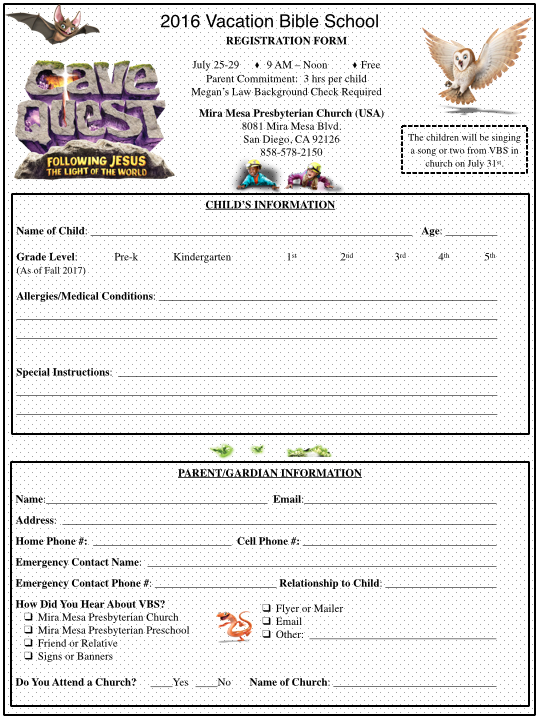 Now registering children from age 4 to 4th (5th) grade. We are limiting enrollment to the first 60 registrations. • Register your child now for this exciting experience! • Print out the registration form below. Complete it and return it to the church office, today! • Older children, preteens & teens are welcome as volunteer helpers & leaders. • Parents are being asked to sign-up for 3 hours of their volunteer time during the week. • Print out the registration form. • Complete it and return it to the church office, today!